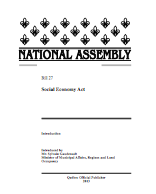 On March 19, the Québec Government introduced the Social Economy Act. The objective of this bill is to recognize the contribution of the social economy to the socioeconomic development of Québec and to determine the role of the Government in that area. It works to promote the social economy and support its development through the creation and adaptation of policy tools, and to foster access to the Administration’s measures and programs for social economy enterprises. The Chantier de l’économie sociale and the Conseil québécois de la coopération et de la mutualité are designated as primary interlocutors of the Government on the subject. The functions of the Minister of Municipal Affairs, Regions and Land Occupancy as regards the social economy are clarified, and a Panel of Social Economy Partners is created to advise the Minister. Ministers must take the social economy into consideration in existing measures and programs, when updating those measures and programs, and in developing new tools for enterprises. They must also, whenever it is relevant, promote the social economy initiatives carried out in Québec. Lastly, measures are proposed to ensure the Administration’s accountability with respect to the social economy through planning, follow-up and reporting, including the adoption of an action plan and the tabling of reports on the carrying out of the Act. It is hoped that the Act will be passed by summer. Congratulations to the Chantier de l'économie sociale and the Conseil québécois de la coopération et de la mutualité on this significant accomplishment.